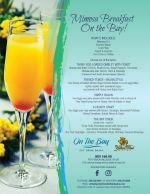 On The Bay is a newly renovated poolside restaurant, bar & lounge ideally located at the Yellow Bird Hotel, facing the picturesque St. Lawrence Bay. On the Bay offers a Mimosa Breakfast, served daily until 12:00 noon. Enjoy deliciously prepared and beautifully presented local Barbadian dishes cooked with fresh herbs from the kitchen garden. Price: Bds $60.00 - inclusive of VAT; 10% Service Charge to be added to bill.